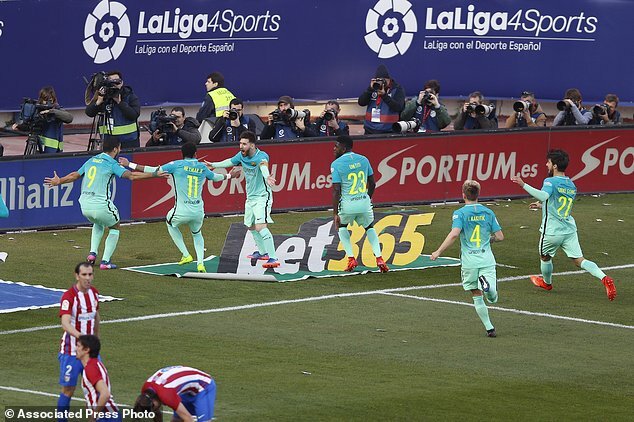 Lionel Messi added to his impressive scoring run this season with a late winner in Barcelona's 2-1 victory over Atletico Madrid on Sunday, a result that vaulted the Catalan club ahead of Real Madrid in the Spanish league. Messi scored his 35th goal in 35 games with a shot from close range after a pass by Luis Suarez in the 86th minute, giving his team a two-point lead over Madrid, which can return to the top when it plays at sixth-placed Villarreal later Sunday. It was Messi's league-leading 20th goal, and his 11th in the last 10 league games. FC Barcelona's Lionel Messi, center left, celebrates after scoring a goal during a Spain's La Liga soccer match between Atletico de Madrid and FC Barcelona at the Vicente Calderon stadium in Madrid, Spain, Sunday, Feb. 26, 2017. The result also gave the Argentina star his 400th victory since his official debut with Barcelona in 2004. The late goal, scored off the rebound of a shot that was initially blocked by a defender, was the latest blow dealt by Messi against Atletico - the team he has scored the most goals against in his career. It was Messi's 27th goal against the Madrid club. Barcelona has won five of the last six league games against Atletico, which hasn't beaten its rival in the last seven games at home dating back to 2010. "Unfortunately we have not been getting good results against them, but in all these matches we have played well and shown that we could win," Atletico coach Diego Simeone said. Atletico, which had won four in a row at home and was unbeaten in eight league matches, dropped nine points off the lead. "We have to stay calm," Simeone said. "The goal doesn't change. We will see where we stand in the final rounds." Barcelona badly needed a convincing victory to regain confidence following an unimpressive 2-1 win over promoted Leganes - when Messi also scored a late winner - and a demoralizing 4-0 defeat to Paris Saint-Germain. The Champions League thrashing raised doubts about the team's potential under coach Luis Enrique. "It was important to leave Atletico further behind in the title race," Luis Enrique said. "It is a direct challenger for the league title." Atletico dominated the first half and created most of the scoring chances, but Barcelona evened the match in the second and took advantage of its opportunities in front of the goal. Rafinha put Barcelona ahead after a scramble in front of Atletico's goal in the 64th. The midfielder scored from close range after Suarez's shot pinballed around the area, hitting a couple of defenders and himself before getting to Rafinha. Godin equalized six minutes later with a header off a corner kick, and Messi sealed the victory from close range after his initial shot was blocked by a defender in front of the goal. 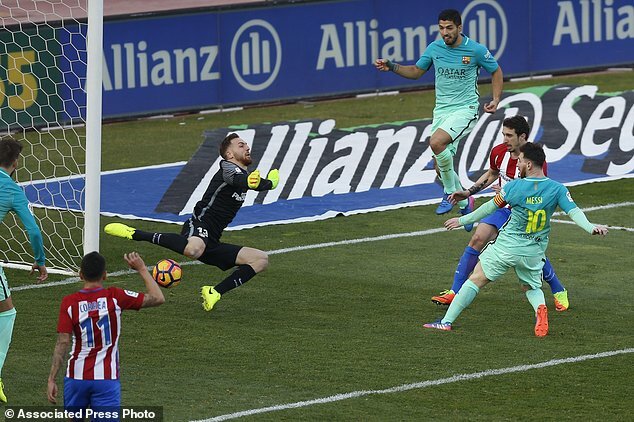 Messi was able to get to the rebound and easily found the net as Atletico goalkeeper Jan Oblak charged toward him. "We played well enough to win, but they scored in two unfortunate plays for us," Atletico midfielder Gabi Fernandez said. "We know it's always difficult against Barcelona, and today it wasn't any different." FC Barcelona Lionel Messi, right, scores a goal during a Spain's La Liga soccer match between Atletico de Madrid and FC Barcelona at the Vicente Calderon stadium in Madrid, Spain, Sunday, Feb. 26, 2017. 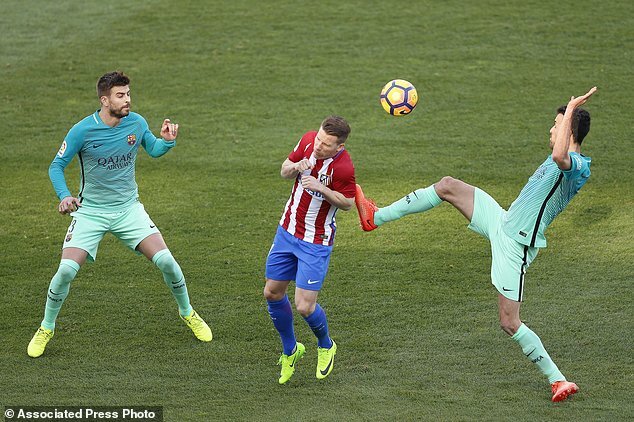 Atletico de Madrid's Kevin Gameiro, center, duels for the ball with Barcelona's Gerard Pique, left, and Sergio Busquets, right during a Spain's La Liga soccer match between Atletico de Madrid and FC Barcelona at the Vicente Calderon stadium in Madrid, Spain, Sunday, Feb. 26, 2017. 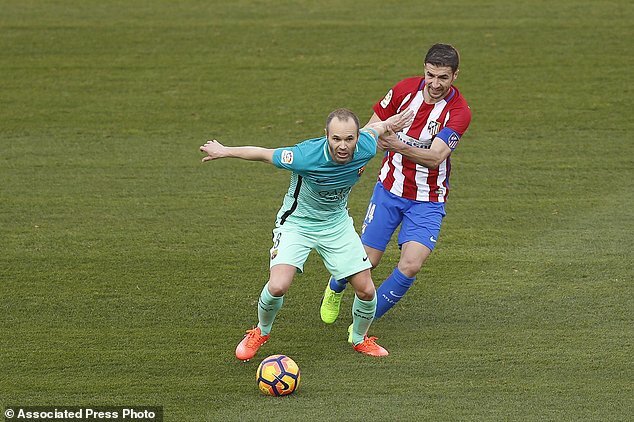 Atletico de Madrid's Gabi, right, duels for the ball with Barcelona's Andres Iniesta during a Spain's La Liga soccer match between Atletico de Madrid and FC Barcelona at the Vicente Calderon stadium in Madrid, Spain, Sunday, Feb. 26, 2017. 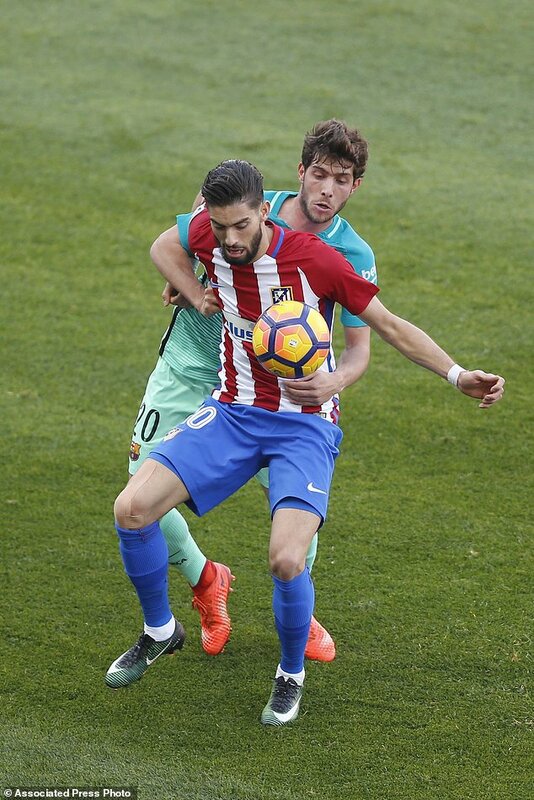 Atletico de Madrid's Carrasco, front, duels for the ball with Barcelona's Sergi Roberto during a Spain's La Liga soccer match between Atletico de Madrid and FC Barcelona at the Vicente Calderon stadium in Madrid, Spain, Sunday, Feb. 26, 2017. 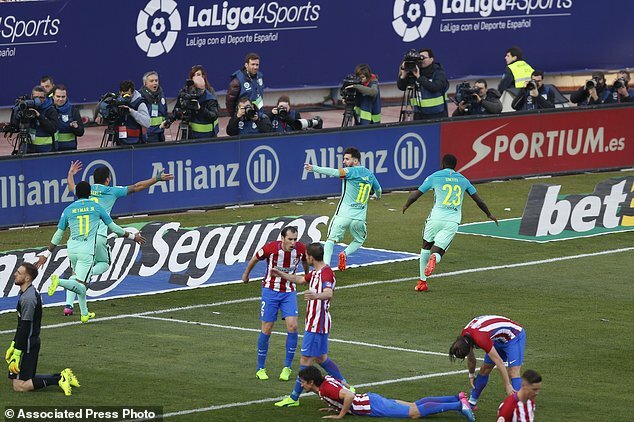 FC Barcelona's Lionel Messi, up second right, celebrates after scoring a goal during a Spain's La Liga soccer match between Atletico de Madrid and FC Barcelona at the Vicente Calderon stadium in Madrid, Spain, Sunday, Feb. 26, 2017. 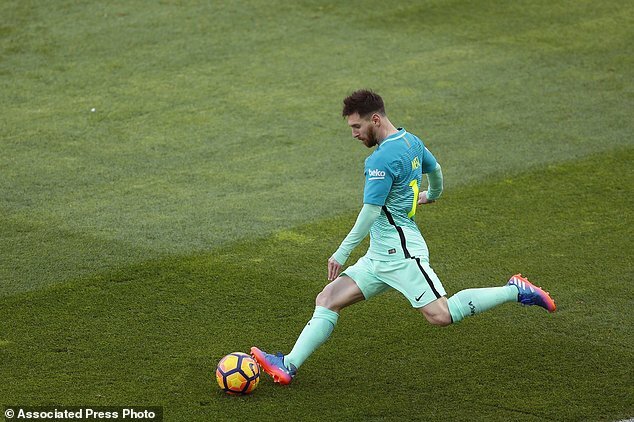 FC Barcelona Lionel Messi kicks the ball during a Spain's La Liga soccer match between Atletico de Madrid and FC Barcelona at the Vicente Calderon stadium in Madrid, Spain, Sunday, Feb. 26, 2017. 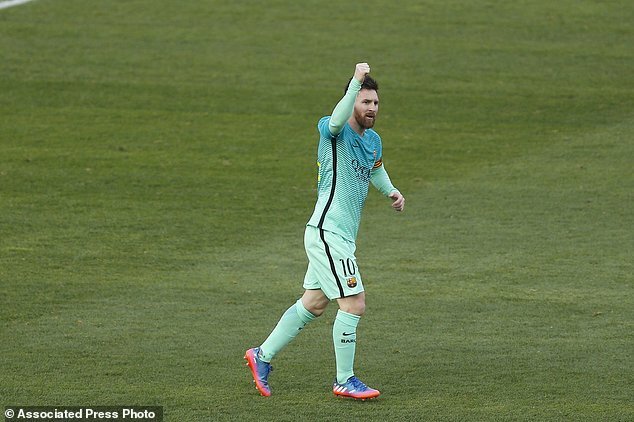 Barcelona's Lionel Messi celebrates after scoring a goal during a Spain's La Liga soccer match between Atletico de Madrid and FC Barcelona at the Vicente Calderon stadium in Madrid, Spain, Sunday, Feb. 26, 2017.